John Hotchner is a writer, editor, researcher, and lecturer on stamps. He has served on numerous boards, including the American Philatelic Society, the United States Stamp Society, and the American Association of Philatelic Exhibitors, and is currently a member of the Postmaster General’s Citizens’ Stamp Advisory Committee and the Smithsonian National Postal Museum’s Council of Philatelists. Hotchner collects stamps from 20 countries, but his chief passion is U.S. errors, freaks, and oddities, or EFOs. My father was a stamp collector, and I just took to it. He was perfectly happy to mentor me, so I began collecting at the age of five and got serious about it around the age of 11. I started collecting the world, but when it became obvious that that was not something that I could ever complete, I reduced my scope to about 20 different countries, including the United States. Early on I got interested in errors, freaks, and oddities, known as EFOs, including interesting cancellations and color varieties. Eventually that led to learning about the origins of errors and mistakes in the production process. I would ask my father about stamps with flaws, and some of it he couldn’t explain. I started looking for information in the philatelic literature, publications such as Linn’s Stamp News and The American Philatelist, about how these mistakes happened and what existed in the error, freak, and oddity line. When I own something, I want to know not just what it is but how it came to be. There are particular definitions for each category. Errors are defined as a major mistake that’s repeatable. The standard reference in the philatelic hobby, the Scott Catalogue, lists errors such as missing perforations that affect a whole side of a stamp, either vertically or horizontally. Freaks are defined as minor variations, where the perforations are only partially missing, for example. They are not listed in Scott, and though freaks often display the same effect as errors, they’re slightly different in each instance. Oddities are examples that don’t fit in the other two categories. Test stamps, for instance, were printed to test dispensing machines. They were never meant for public distribution. There are a couple of other examples, such as stamps on which no design has been printed or where the perforations were made for one format, say for coils (rolls of stamps), but then the stamps were actually used in booklets, so it looks like a misperforation but it really isn’t. It’s not a freak; it’s an oddity. Collectors Weekly: How long have error, freak, and oddity stamps been collectible? Hotchner: Error collecting has been around from the time the British issued the first stamp in 1840. From the beginning there were mistakes such as creases in the paper, very light printing, and excessively heavy printing. Nearly all collectors will pick up an error if the price is right and add it to their album, even if they don’t focus on it as a specialty area. A bent perforator pin caused this misaligned perforation. My particular interest is in what’s called stamp separation—how perforations are added to sheets of stamps to make them easy to use. In fact, I’ve collected stamps as a means of showing how perforations developed over time. Stamps were first introduced without any perforations, and they were torn apart or cut with scissors. By about 1854, the English added perforations or small holes, between the stamps to make separation easy. Stamp printers experimented with the size of the perforations for a long time before they came up with the right number of holes to facilitate tearing the stamps apart from one another. Even now, 150 years after the system was first introduced, stamp printers are still trying to invent the perfect machine that can, without exception, perforate accurately and quickly. There are about 20 different major categories of perforation varieties, including missing holes, perforations of the wrong gauge (that is to say, the number of holes per 2 centimeters), misplaced perforations, and “crazy” perforations caused by a fold in a corner of a stamp sheet. Problems occur when a part of the production process—watermarking, the type of paper used, printing, and so on—impact the placement of perforations. For example, it used to be that paper had to be wetted down in order to accept an engraved impression. If the paper dried unevenly, which it often did, when it went through the perforation machine, the lines of holes would fall inside the design instead of between the stamps. There is no perfect system to this day, and the more complex the equipment is, the more things can go wrong. Starting and stopping the machines, for example, can cause problems. Collectors Weekly: Have errors, freaks, and oddities gone through the mail? Hotchner: Yes. A prize find is a stamp that has made it through the production and inspection processes as an error, freak, or oddity, and then is sold as postage. Sometimes postal clerks don’t recognize a problem with stamps they sell. Once I actually stood in line behind a postal customer who was returning stamps and said, “I can’t pull these apart. I want new ones.” Little did they know that they had imperforate stamps (stamps that went through the production process without perforations), and they could’ve made a bundle of money by selling them well above their face value. Instead, they returned the stamps to the post office as defective. The yellow background is inverted on this U.S. 4¢ Dag Hammarskjold stamp from 1962 (Scott 1204). It was reprinted after the invert error was discovered. These kinds of mistakes are inevitable with the speed of modern production. There is hardly a modern coil that does not exist as an imperforate error, and that’s because they are the most heavily produced stamps. They get very little human intervention during the production process and so if something goes wrong, the errors go through. There are many ways an imperforate can occur. The perforator, which is a set of pins, may not come down and put holes in the sheet at the start of a print run, at the end of a print run, or when the roll of paper tears and has to be repaired. These mistakes happen repeatedly because there isn’t a way to eliminate the basic cause. The great majority of imperforates are caught and destroyed. The private printing firms that produce stamps for the Postal Service have a high degree of internal security, and they have installed electronic cameras into the production system to catch errors. The firms also inspect the final product and destroy errors, freaks, and oddities so that the minimum possible problem material is distributed to the public. But the numbers are so huge—the United States produces 40 billion stamps with 125 or so different designs a year—there’s no way in the world a manufacturer can look at every one of those stamps. A small percentage of the stamps are going to be flawed. But if there are between five and 10 errors a year, that’s a lot. Collectors Weekly: How does a stamp fail to get its color? Hotchner: The press can run out of ink. On a multi-color stamp, it could run out of a particular color. During the startup and wind-down of a press, things tend not to work as smoothly as they do during the print run, and color can simply not be applied. Or fold-overs can occur, where the paper folds during the process and you get color at the back of the stamp but not on the front, for instance. There are many ways for that sort of thing to happen. 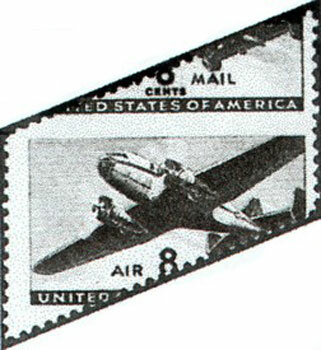 This is an example of diagonal misperforations on the 1941 8¢ airmail stamp (Scott C26). Most American stamps through the 1960s were printed by line engraving, a process in which the paper is pressed into a plate that’s been incised with the design. That means if no color has been applied to the paper, the paper will still show the design raised off the surface of the paper. You can tell what the stamp should have been by looking at the design. You can also tell what color the stamp should have been if it is attached to a sheet that has some of the intended color on it. Colorless stamps are rare. Many test stamps, which are collected as oddities, have no color, but if you get them in a booklet pane or as a roll of coils, then you can tell that they were intended for testing purposes. Test stamps are unissued and they’re also uncontrolled, which is to say they have no value—some of them say ‘for testing purposes only’. Others are just a block of color. Others may have a design to simulate a stamp, but they’ll also have a 00 on them. When the post office uses them for testing, occasionally they’ll be thrown in the dumpster instead of being destroyed. This is how collectors, who are not too proud to dumpster dive, often get a hold of the test stamps. Collectors Weekly: Between errors, freaks, and oddities, which area is most popular? Hotchner: For those who focus on EFOs as a primary collecting area, we’re happy to get anything; the general collector is focused more on errors. What’s interesting is that the value of these things is determined by how visual they are. The more obvious the mistake, the more sought after it is. Stamps that are listed in catalogs tend to be collected, but as a collector, you want to fill empty spaces in your album, and that can make a particular stamp more desirable to you than to another collector with a different focus. Rarity is also subjective. Often the stamps people want the most have a story behind them. Probably everybody in the world knows about the 1918 Inverted Jenny, a 24-cent, U.S. airmail stamp in which the plane was printed upside down. There were a hundred of those created, and we know where about 97 of them are. It’s not a rare stamp. Examples come up at auction two or three times a year. But if you’re going to be a serious collector of errors, freaks, and oddities and you have a couple hundred thousand dollars, that’s the kind of thing you want. A lot of regular U.S. stamp collectors want that stamp as well. That’s why it’s so expensive. There are other stamps that exist in many fewer copies that are affordable, but they don’t command the same interest level. This example of Scott 1608 has blind vertical perforations, which are perforations that have been punched, but not punched out. Many stamp collectors are just interested in certain stamps with errors. For example, some people collect the 1869 issue of the United States, which is the first set of commemoratives the U.S. issued with other illustrations besides pictures of people. For people who collect the 1869 issue, they’re interested in cancellations, they’re interested in the basic stamps, and they’re interested in reprints. But they’re also interested in error, freak, and oddity material. Several of the 1869s were bicolor stamps, which meant that they had to be put through the press twice, creating the possibility of inverts or upside-down images. And, indeed, there are inverts associated with this stamp issue. A serious 1869 collector is going to want those inverts. They may not care about any of the other EFO material that exists in American philately, but for that set, they want the inverts. Probably the next best-known error stamp is what’s called the CIA invert. As the story goes, an agency staffer went to a post office in McLean, Virginia and bought a sheet of 1979 issue $1 stamps to be used on agency mailings. This one sheet had an image of a candleholder inverted, and it’s become known as the CIA invert. There are a hundred of them known, and they are valued at $21,000 per stamp. That’s a pretty good return on a $1 investment. There are also inverts of several other modern U.S. stamps. The Richard Nixon issue—that’s a 32-center, I think—exists with Nixon inverted, but those were stolen from a private printer working for the Postal Service. They were never released to the public as errors. The printer’s production waste wasn’t completely destroyed, and someone who worked in the printer’s office sold the flawed stamps. Collectors Weekly: Is it difficult to find flawed stamps? Hotchner: They’re fairly hard to find at this point. Color varieties don’t cost much more than the basic stamp, but stamps with an actual error—where the wrong color was used or where a design element is placed upside down on the sheet—are very expensive. It’s very unusual to find errors or freaks from the modern era. The speed and reliability of modern press equipment is very high. But for the really old ones, I’d like to think there are a lot out there that haven’t been discovered in old collections. They look like regular stamps unless somebody looks carefully to see that the perforations are the wrong size or that the wrong value has been impressed on it. Collectors Weekly: How does a stamp with a design error get into circulation in the first place? 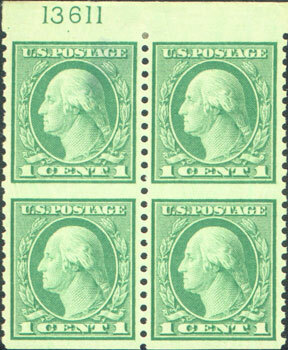 The black ink which comprises the engraved portion of this issue is missing from the stamp at left (Scott 1488b). 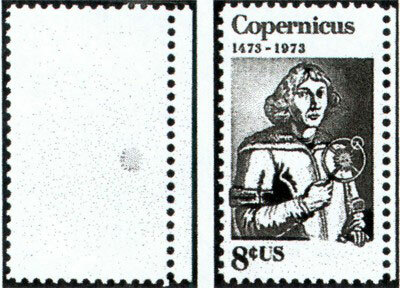 The normal U.S. 1973 8¢ Copernicus stamp is shown at right (Scott 1488). Hotchner: It happens very rarely. Usually a design is approved, produced on a stamp, and sold at the post office before somebody discovers that a mistake was made. You see, every stamp has an issue date, so the goal is to catch mistakes before the issue date. If the issuing authority, the U.S. Postal Office, finds a mistake before that date, it will instantly tell its 40,000 retail outlets not to sell the stamps. But some post offices will get a shipment of stamps and start selling the stamps before they should, before the issue date, and that’s one way a design error can get into circulation. The best-known recent U.S. design error is the Legends of the West sheet issued in 1993. The Bill Pickett stamp was printed with the image of Pickett’s brother, Ben. After a few of the sheets had been sold, the Pickett family contacted the Postal Service and the mix-up was reported in the press. It became a national story, and the Postal Service told its outlets to destroy what they had in stock and it reprinted the whole issue. To offset the cost of the reprint, they sold 150,000 of the error sheets in a lottery. Today, sheets with the faulty pane list for $250 apiece compared to ones with the normal stamp, which is the corrected reprint, which go for $15. Collectors Weekly: What other sorts of errors are collectible? Hotchner: Probably the one that you see most often is a cancellation before the first day of issue. If the post office isn’t careful about waiting to sell a new issue, the stamp may end up with a cancellation prior to the first day, and that’s a big deal to collectors. But there are many other kinds of cancellation errors which include dating mistakes made by postal clerks. I have a stamp cancelled November 33rd. They can put things in upside down or spell things wrong or leave things out entirely. There are lots of different types of cancellation errors. There are also errors concerning the different kinds of paper used for different printing methods. Sometimes paper with a watermark produced for a booklet will get used for regular stamp production. In the old days, when they printed stamps on sheet-fed machines, that happened fairly frequently. It was simply a matter of somebody picking the wrong paper off the shelf. Now it’s much harder to use the wrong papers because they’re in large rolls called webs that travel through a press very quickly. Collectors Weekly: Is it possible to figure out how each EFO happened? Hotchner: If you know a little bit about the press process or the finishing process, and by that I mostly mean perforating and cutting, you can figure most of it out. But with the older stamps it’s almost impossible because the equipment no longer exists. It took us a long time, for example, to figure out what happened with the 24-cent Inverted Jenny. We had to study the sheet markings (plate printers placed these on the edges of the sheets to help them determine what edge of the sheet to put into the press) before we could figure out what caused the inversion. Even with today’s modern equipment, we’re sometimes stumped because the producers won’t talk to us. They don’t care if a color is slightly off or if the perforations aren’t exactly where they’re supposed to be. All they care about is whether the stamps can be used for postage, and it costs them extra to help us determine the cause of production mistakes. Collectors Weekly: Are errors, freaks, and oddities collected worldwide? Hotchner: Stamp collecting is an international hobby, and every kind of a stamp is collected someplace. Every country that produces stamps has errors, freaks, and oddities, and most often they are considerably more expensive than normal stamps. 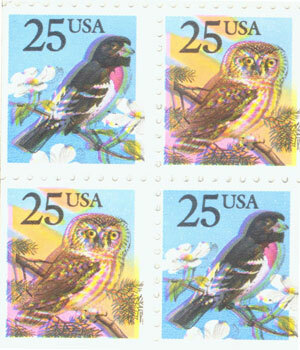 These are examples of color misregistration on a sheet of 25¢ stamps from 1988. I collect errors, freaks, and oddities from all over the world, and the types of flaws you see are pretty standard. The emphasis may change from one area to another—lots of color varieties in one country, perforation varieties somewhere else—but the stamp production processes are, at least in the First World, consistent around the globe. My single most favorite error from any country is from right here in the United States. In 1922, the U.S. issued stamps with pictures of George Washington and Benjamin Franklin on them. Those stamps were all issued with 11-gauge perforations, which means 11 holes per 2 centimeters. Somewhere in the process, a perforating pin section broke, and the press people replaced that broken section of 11-gauge perforations with a 10-gauge replacement. These are very scarce, probably less than a hundred of any given value. I found two of them in old albums, and the Scott Catalogue gave the stamps major numbers several years ago. Stamps that I bought 25 years ago that were worth hundreds of dollars are worth thousands now because they are Scott-listed errors. That was a nice surprise. Collectors Weekly: Is this area of stamp collecting growing? Hotchner: Prices for EFOs have remained stable, even in a bad economy, so I think it’s fair to say that EFO collecting is one of those areas of the hobby that is growing. Prices are steady and in some cases rising. I’m not worried about my collection becoming less valuable. There are a lot of collectors who get excited about all errors, freaks, and oddities and there are many who collect only EFO material associated with a particular issue. The $1 candleholder is part of the Americana Definitive Issue, a set of small stamps that you could buy at the post office in the late 1970s. There are Americana collectors who want any EFO material associated with that whole issue. There are people who collect American flags on stamps that want EFO material associated with American flag stamps, and there are people who only want inverts, missing colors or fold-overs. So yes, it’s a hobby unto itself. The collector gets to define what their interest is, what they want to collect, what level of investment they’re willing to put into it, how to display their stamps, and how they trade or buy. Collectors Weekly: What advice do you have for a new collector of errors, freaks, and oddities? Hotchner: Learn as much as you can about philately and this particular area of stamp collecting before you put money into it. Like any other hobby, where there is value there are people who are going to try to capitalize on that. Only an expert can tell whether some EFO material is genuine. So before you buy anything, make sure you have the expertise to recognize what’s valuable. If you don’t have the expertise yourself, use an expertising service connected to the American Philatelic Society or the Philatelic Foundation to assure that you are spending your money wisely on genuine errors. Collectors Weekly: What books do you recommend? A paper crease that occurred before printing was opened up before perforating (Scott 498). Hotchner: There isn’t a standard handbook that lists all EFOs. I recommend Stephen Datz’s Errors on U.S. Postage Stamps, which lists and illustrates all the known missing color stamps, imperforates, and inverts. It has a section on printers’ waste and another on other existing varieties. That’s probably the single best reference out there at this point. It’s also important to be part of the community and know people you can ask questions of. Stamp collectors like to help each other. The EFO Collectors’ Club at efocc.org exists to help collectors find things for their collections and to facilitate trading and bartering for the stamps we want for our collections. We have 300 members, a quarterly journal, and the most knowledgeable people in the hobby are members. This article is very well and interestingly written. Your article is great for novice EFO afficinados and experts alike. My only ‘complaint’, is that you discussed the $1.00 CIA Invert (Scott 1601c) but showed the 50c Rush Lamp with a vertical perforation separation error (Scott 1608). The latter, in my opinion is not as interesting as the former; but maybe an example of the former was not available at press time. I can send you a scan for a later use! I found this article very interesting to read. Thanks for furthering the EFO hobby. your interest in flawed stamps has jogged my memory about a stamp I received on mail almost a decade ago. It’s a single copy of the 20c Ringed necked Pheasant issued in 1998. This copy shows a large yellow flash beneath the eye beginning at the back of the beak. The stamp still has it’s gloss coat and is not damaged in any way under 10x Mag’. The stamp looks like a new variety of the Pheasant which I call FLASH-EYED. Have you seen others similar.? Have u a e/mail address so I can show this unique flash-eyed Pheasant? Thank you for your time. As a novice collecting EFO’s and a new member to the EFO’s Collector’s Club I enjoyed reading your article. The perspective of different venues in collecting EFO’s is explained that will assit in developing my collection. Thanks John for the write up. I have been meaning to ask you for years if you lived in Arlington when you were a kid. The reason is years ago, in a Linn’s, you wrote about your dad cutting an envelope to store stamps. This reminded of a trick we would do in the Arlington stamp club. If you don’t get this, I will write you at home some day. member of the California Collectors Club in San Francisco. Harrison and that serms to be the only difference. Years ago I purchased a large bag of us stamps on paper which contained a lot of the same stamps but as I soaked them off the paper I noticed one of the stamps was different from the others. It was a scotts #2108 Christmas stamp but it had no red color in it. I have searched extensively but cannot find anything about it. Can you help identify this stamp. I have Scott 787 (1936 Army issue, 3 cents) in good, postally used condition. But it is carmine, identical in color to the 2 cent #786. I have never read or heard of a bright red #787. What do you think? Thanks. A quick search of the stamp catalogs (not just Scott’s) shows very quickly that the term error is not used identically. 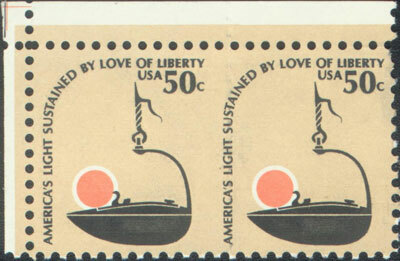 One catalog will list a stamp as an error such as a gutter, and other catalogs will ignore it. Thus, the term EFO is still not, and probably will never be defined to the satisfaction of the collector and stamp dealers. No reference material exists (at present) about freaks. How many examples of a color shift are known for the U.S. 1610? Without that information, pricing a freak is a real test of nerves. Oddities is the least defined of the EFOs. Collectors need to come together and answer basic questions about EFOs. This information might also help weed out faked EFOs. I acquired some years ago while working for the USPS, a booklet of the 37 cent Mary Cassatt self adhesive booklet pane. 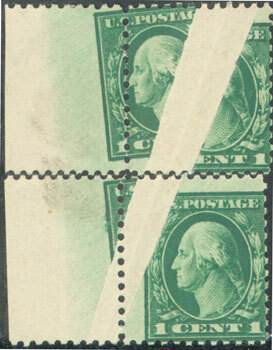 The pane was printed well off center, with parts of 3 stamps on each line. I am wondering if this was a common error, and what the value may be. I can send a pic if requested. Thank you. Any comment on this: USPS stamp catalog with Houdini stamp depicted as 34 cents? It was issued at 37 cents. Haven’t been able to find a thing yet. Thank you. I have a RED Eugenie O Neill 1 dollar stamp 1967, that should be violett.Is there anyone that can explain what has happene? I have experimented with bleach,sunshine for 4 month, 5 % vinegar, but the stamps keeps it violett coulor.best regards Lars. “ ” By the time Washington was elected president, he only had one natural tooth remaining in his mouth.